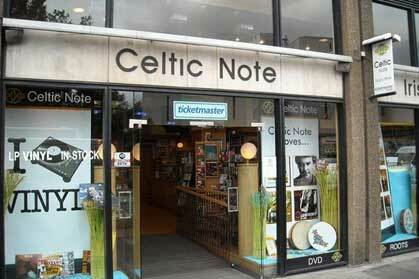 Celtic Note music store on Dublin’s Nassau Street. One of my favorite music shops in Dublin is the Celtic Note on Nassau Street across from Trinity College and steps away from Grafton Street and Dublin’s central shopping district. Whenever I am in town I make a point to stop there as I can expect to find new releases along with some of the classic trad recordings that somehow eluded me over the years. Not unlike other treasured shops around Ireland, you can count on staff who know their music and who tastefully select and air music worth hearing. This particular shop goes the extra mile and produces some fine compilation CDs worth noting because they assemble an extensive sampling of some great old and new work from artists like A Stor Mo Chroi some years ago, which inspired a Christ church concert at last January’s Temple Bar Trad Festival. And so another collection called Irish Ways: Music & Son of Ireland has just been released which modestly proclaims “these songs and pieces of music record and recall experiences that are distinctly Irish. They remind us of people, places, times and above all the spiritual landscape that is called ‘Home’ by so many living both here and abroad” on the inner booklet flap. It’s not a greatest hits effort by any means, but rather a representative sampling of the extraordinary output that Irish artists have created over the past five decades of what we call the folk music revival era. As such it contains some new pieces as well that fit in well with the more seasoned material chosen. The double CD set contains 34 tracks that run the gamut from Horslips to Kila to Solas to Liadan to We Banjo 3 to La Lugh to DeDanann (Alex Finn’s tribe) to Lunasa to At First Light and Dervish featuring ensemble groups. Duets would include offerings from Moya Brennan and Cormac de Barra, Seamus Begley and Oisin MacDiarmada, Paddy Glackin and Micheal O Domhnaill and Lumiere. There are solo efforts galore, and also featured are Triur, a trio combination of Martin Hayes, Caoimhin O Raghallaigh and Peadar O Riada. More information and availability can be found at www.celticnote.com.